I didn't want anything too complex or expensive so the Edge 200 was perfect for my needs. I found out that Garmin was doing a £30 cash-back offer on the device. Basically send them proof of purchase and a photo of your old cycle comp and you get £30 cash-back in 28days. I looked on eBay to see if I could pick up one dirt cheap but after seeing how much they where going for there it was the same as buying from the shop and using the cash-back deal on offer. So atleast if I bought it from a shop I would have a full 1 yr guarantee. I thought I'd use both my cycle computers at the same time to see if there was any difference. My old Cateye Velo Wireless Cycle Computer looks ALOT smaller than the Garmin Edge 200 but then the Garmin does a hell of alot more stuff. Once I turned it on while outside the Garmin Edge 200 acquired GPS signal pretty quickly (20secs), if in built up areas it takes a little longer. Even in a little traffic I encountered on a Bank Holiday morning I could hear the sounds of the Garmin whenever it was giving me a message mostly whenever I stopped/started or when it lost a signal a couple of times when going into abit of heavy forest. I logged a couple of rides and found it to be easy to find the functions I needed to do this and even surprised with the breadcrumb function to follow if needed. Didn't actually try this out to see how good it would be to follow the breadcrumb map to a destination, maybe later when I get more used to it. Got to Victoria Park in Hackney as I wanted to log a training loop around the park so I could use it later a course and use for more training in the future to see where I need improving etc. 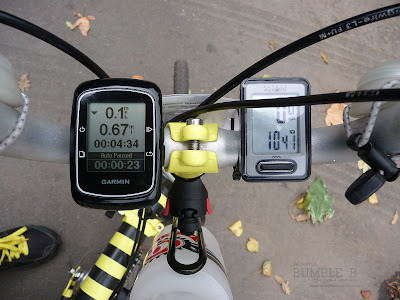 When I returned home I downloaded all the logs from my rides and loaded it up into the free Garmin Connect web site where you can view your cycling logs in detail and even overlay maps etc. Very interesting reading all the different stats.